It’s an all too familiar scene: you’re at the supermarket picking up dinner and a nice bottle of wine. It’s Friday and you just want to get home and relax. The queues for the staffed checkouts are long and you’re in a rush to catch the train home so you opt for the speed of self-checkout. But as soon as you scan your wine, you’re told that assistance is needed. You look around but there is no one to be seen. When you do spot a member of staff you smile and wave letting them know you need help. But before they reach you they stop to help someone else. It turns out the customer has picked up the wrong product and you’ve got to wait for the checkout assistant to run off to the opposite side of the supermarket and back, then fix the problem on the other EPOS before they can check your ID. Your chances of catching that train are long gone. Once assistance has arrived, they either check your ID (depending on how young you look), or bypass the age restriction screen and let you continue with your shopping. 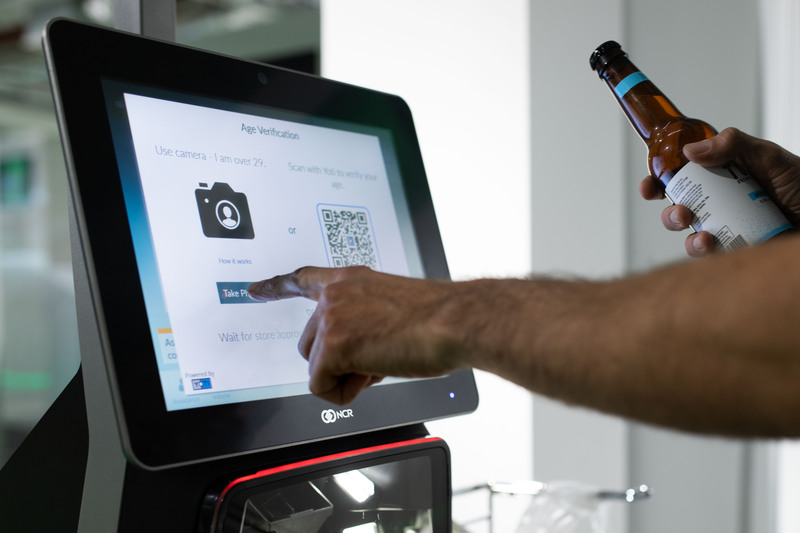 Wouldn’t it be great if you could buy a bottle of wine at the self-checkout without having to hear, ‘please wait for assistance?’ Well, now you can. We’ve partnered with digital checkout leader NCR, who has integrated Yoti technology into its self checkouts. The partnership allows shoppers to buy alcohol and other age-restricted items without the need for staff intervention. Shoppers can prove their age in one of two ways. Yoti Age Scan – age estimation technology uses the self-checkout’s inbuilt camera to capture a photo of the shopper’s face and determine whether they are over the set age limit for the product(s) they are buying. Yoti app – shoppers download the free Yoti app and create a secure digital identity. They combine their biometrics, like their unique facial features and the distances between them, with details taken from their government-issued ID document, like their passport or driving licence. They then simply use the Yoti app to scan a Yoti QR code displayed on-screen at the self-checkout to share their verified date of birth. Age checks account for over 50% of all staff interventions at self-checkouts. So not only are ID checks a pain for customers, but they’re an inefficiency for supermarkets too. Yoti Age Scan returns an accurate age estimation in 1–2 seconds, dramatically reducing the time spent at checkouts. Using the Yoti app to prove age is equally as fast and provides an exact age every time. If you use the Yoti app to prove your age, all you need to share is your verified date of birth and photo. No other personal details are shared. If you use Yoti Age Scan, we take a photo of your face to estimate your age. Once your age has been determined, your photo is permanently deleted. We designed Yoti Age Scan with user privacy and data minimisation in mind. It doesn’t require you to register in advance and you don’t have to share any personal details. No personal information is retained whatsoever. Expect to see major retailers introduce Yoti technology in the coming months. Watch this space.